Aboriginal and Torres Strait Islander graduates from Research Higher Degrees note that the research experience they gained as undergraduate students was key in igniting their passion for research. Early research experience allows you to build your skills in critical thinking, develop innovative ideas, analyse data and clearly explain results. Becoming involved as a researcher as an undergraduate student is an ideal way for you as an undergraduate (including honours) or coursework Masters student to test drive research before enrolling in a Research Higher Degree. By engaging in undergraduate research, you will learn to apply what you already know to new issues that interest you. You will meet others with similar interests, gain confidence, define your own style, deepen your connections to community, and use your experiences to help you choose a future career path. You may also create new works that are appreciated by the university community and beyond, experience the joys of scholarship and the thrill of discovery. Participating in an undergraduate research conference provides a great opportunity for you to meet students from other universities and to share your research. You will have the opportunity to network with other undergraduate researchers from your own discipline, and also to learn about how other disciplines approach research problems. The Australasian Conference of Undergraduate Research is held each year in different universities on an ongoing basis. This two-day conference includes poster presentations and spoken papers by Undergraduate students, Master of Research students (1st year only) and graduated Honours students from all disciplines and from across Australasia. The Journal of Undergraduate Research is supported by the Office for Undergraduate Research and Artistry in the Institute for Learning and Teaching at Colorado State University. The journal combines undergraduate and faculty involvement to create a cooperative approach to the peer review process and is registered with the Library of Congress. Submissions may include original research, abstracts, editorials, reviews, or other creative works. Undergraduate associate editors, peer reviewers, and faculty reviewers will rigorously review each submission. Any research submission must include the Permission to Publish completed and signed by the student’s faculty advisor(s) and other coauthors. The painting depicts pathways for Aboriginal and Torres Strait Islander students into doing research. The circles are meeting places where discussions about research can occur and the semi-circle shapes around each circle signify Aboriginal and Torres Strait Islander students. The purple circle represents undergraduate study. The blue circle signifies postgraduate Research Higher Degrees while the red circle depicts undertaking research. The blue circle is smaller than the purple circle because while the numbers of Aboriginal and Torres Strait Islander students undertaking undergraduate study has grown there are still smaller numbers of students continuing on to Research Higher Degrees. The curved grey and black lines that join the circles signify the pathways between undergraduate study, Research Higher Degrees and careers in research. These pathways are all connected and linked – students can undertake research in their undergraduate degrees, between undergraduate and postgraduate study, as well as during Research Higher Degrees and beyond. The smaller circles at the top of the painting signify the diverse areas that Aboriginal and Torres Strait Islander people undertake research in. 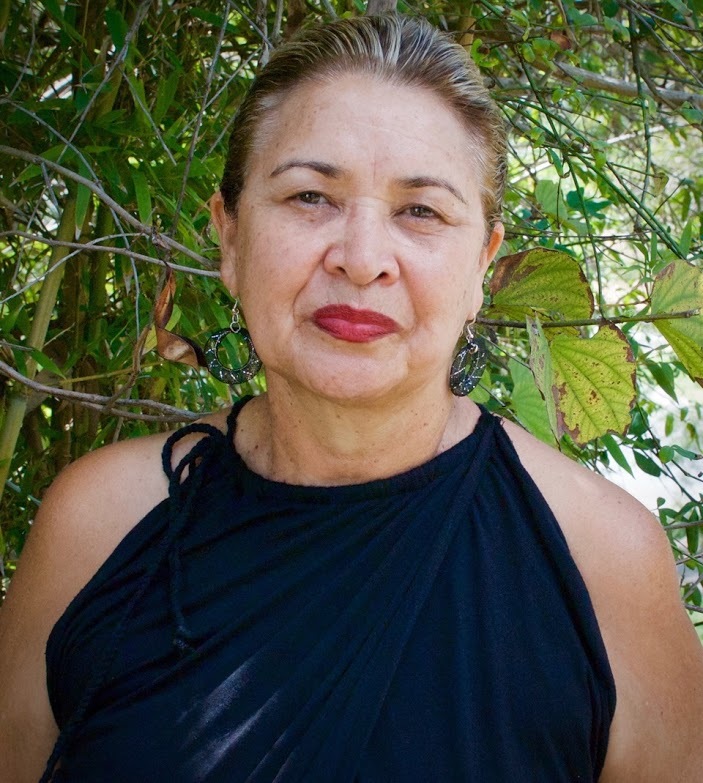 Aunty Denise Proud was born in Cherbourg, an Aboriginal settlement in Queensland, and in Wakka-Wakka country. She was an early childhood educator for many years and is a popular international speaker in this field. Denise has also worked in correctional centres, youth detention centres, and women’s centres and has been closely involved with The University of Queensland facilitating cultural awareness workshops and guest lecturing on a diverse range of topics. Her parents along with many brothers and sisters were major influences in her life and more than a few of the “Chambers” family are well known artists. Aunty Denise has lived for many years at The Gap in Brisbane with her husband David and daughter Monique, where she has set up a studio and likes to paint into the small hours of the morning. She continually supports her family, her community and her country. Funded by the Australian Government Office for Learning and Teaching. A Research Higher Degrees (or Higher Degree by Research) is a supervised research program that requires original research in an area that you are passionate about and is of broader significance to the community.